At the end of the 19th century, African-American politician, Henry Martin investigates the business potential of the Congo under King Leopold’s rule, to discover instead the brutal reality of the colonial slave state. Martin begins a human rights campaign in the North Kivu province, but with the King’s soldiers following close behind, he will need the help of a cynical British surgeon and the leaders of a Congolese rebellion to return home safely with his evidence. 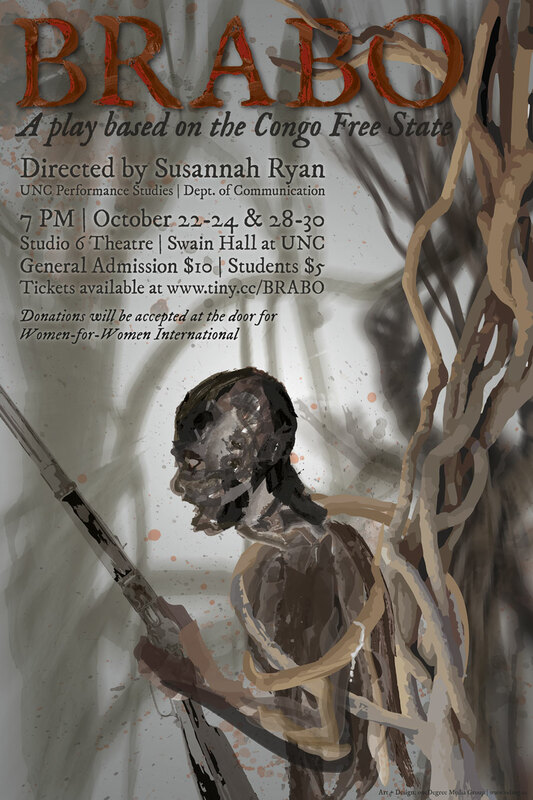 This season’s production of Brabo, marks the project’s first staged performance in Swain’s Studio 6 Theater, after several readings and workshops last year. The Performance Studies program is proud to see the work of graduate student, Susannah Ryan, come to fruition. This historical moment is dramatically retold in a way that captures the racial and political tensions in America and Africa today. Playwright and director, Susannah Ryan, has had experience with both university and professional stages. She has performed lead roles in large-scale productions of She Stoops to Conquer, Hamlet, and the 12 Angry Jurors; additionally, she has choreographed shows such as The Three Penny Opera, Meet Me in St. Louis, Sweeney Todd, and Jacques Brel is Alive and Well and Living in Paris, which she also directed while at the University of South Carolina. The cast of Brabo includes talented local actors Lazarus Simmons, Jonathon Leinbach, Germona Shadi, Nick Popio and Daniel Doyle.